CBC archival footage shows Yippies flooding peacefully across the border during a notorious invasion of the border town of Blaine, Wash., in 1970. It was a warm summer night when rampaging gangs of men tore through Vancouver streets beating passersby with sticks. Even unsuspecting women and children came under assault. The police had a rough time of it, not the least because they perpetrated the violence. 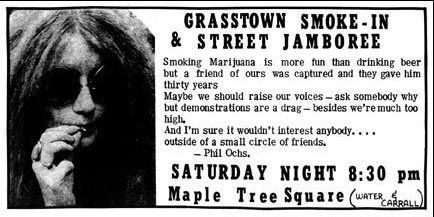 Forty years ago this summer, some 2,000 people gathered on Gastown streets for what was billed as the Grasstown Smoke-In to peaceably protest marijuana prohibition. The night ended in what was widely regarded afterwards as a police riot. Hippies, activists and tourists fell under the truncheon as police on horseback rode through a frightened crowd. Archival footage shows police pulling men by their long hair. The riot served as an exclamation point after many months of tension. The city’s police tried to crack down on drug use even as hordes of teenagers flocked to the city to sample mind-altering substances. The mayor, Thomas Campbell, a millionaire lawyer and property developer, did verbal battle against hippies and longhairs, Marxists and Maoists, Vietnam War draft dodgers and the Georgia Straight newspaper,. The mayor saw all of them as a threat — correctly, as it turned out — to building freeways and skyscrapers. Particularly irksome were a band of anti-authoritarian merry pranksters who called themselves the Northern Lunatic Fringe of the Youth International Party — Yippie! for short. It is this background that serves as the setting for a new musical, “Yippies in Love,” that opens with a preview Wednesday night at the Vancouver East Cultural Centre. The gala opening on Thursday is expected to be attended by about a dozen former members of a group that operated without membership cards. Or leaders. The script and lyrics were written by Bob Sarti, a former Vancouver Sun reporter who both covered and took part in some Yippie stunts. A smoke-in led to a police riot in Vancouver's Gastown. He wrote the play after interviewing old comrades, checking yellowed newspaper clippings, and surveying the CBC’s rich lode of archival footage. He said none of the Yippies regretted taking part. They feel history has absolved them. The Vancouver Yippies lived in communal homes with such tongue-in-cheek names as The Dog House and Charlie Mansion. Combining street theatre with political activism, they tried to levitate the Main Street police station (an echo of unsuccessful attempts to do the same to the Pentagon). A so-called Sip-In to protest the poor treatment of hippie customers at the Hudson’s Bay department store ended in smashed glass and the burning of the Stars and Stripes in a demonstration at the nearby American embassy on May 8, 1970. The very next day, the Yippies took part in an audacious incursion across the frontier, when a crowd peaceably overwhelmed border guards at the Peace Arch and marched through the streets of Blaine, Wash. The invasion was a protest against the invasion of Cambodia and the subsequent shooting of unarmed students at Kent State University in Ohio. During the protest, a trainload of new automobiles got pelted by rocks, causing significant damage. Two months later, the Yippies held what they called a Be-Out at Oakalla prison, knocking down a section of fence but wisely not engaging several hundred guards and police in anything other than some verbal jousting. The Yippies also launched a newspaper (The Yellow Journal), opposed a development while campaigning to preserve as parkland a four-hectare site at the entrance to Stanley Park (today’s Devonian Harbour Park), and ran a candidate for mayor (see below). Where Yippies were once vilified by city fathers, the play is an official part of the city’s quasquicentennial celebrations. In 1970, a young, unwed single mother on welfare ran for mayor of Vancouver as the candidate for the Northern Lunatic Fringe of the Youth International Party (Yippie!). Betty (Zaria) Andrew, a shy, soft-spoken 23-year-old, posed for an election poster published in the underground newspaper, The Yellow Journal. She was shown holding her two-year-old son, Colin, known as Skeeter, in her lap. 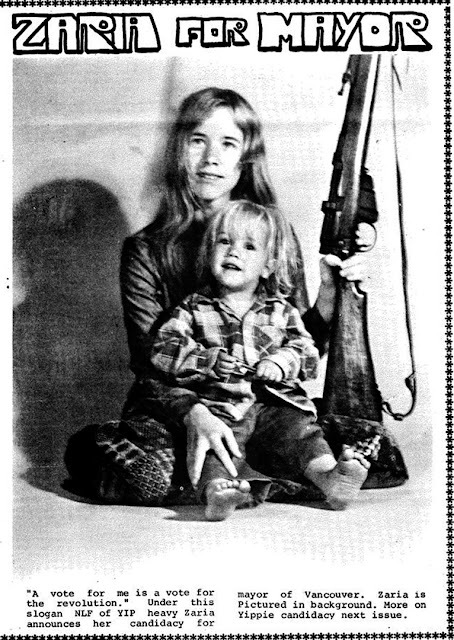 In her left hand, she holds a rifle, an incongruous prop in so maternal a setting. She opposed Thomas (Tom Terrific) Campbell, the avowed enemy of hippies and yippies who was seeking a third consecutive two-year term in the mayor’s chair. A Globe columnist decried Mr. Campbell’s “ostrich indifference to social problems,” but the tough-talking, law-and-order advocate handily won re-election over the reformer Dr. William Gibson. An NDP-sponsored candidate finished third, while the fourth-place candidate, a namesake to the mayor though no relation, was arrested on election night on a drug charge. The Yippie candidate garnered 848 votes in her lone foray for public office. Her clownish campaign served as a precedent for the artist Vincent Trasov, who campaigned for mayor four years later while wearing a Mr. Peanut costume. (The artist said the Peanut surname was an acronym for Performance, Elegance, Art, Nonsense, Uniqueness and Talent.) The anthropomorphic goober took 2,685 votes. Ms. Andrew, 64, who lives in Nelson and Vancouver, retired from the post office last year. She had been a forklift operator. Her fellow workers often elected her as a shop steward. Mr. Campbell, 83, retired from elected office in 1972. He rarely grants interviews.